This morning I woke up with a terrible craving for sandwiches and cupcakes, but I couldn't decide which one to make. So I made cupcake sandwiches, of course! You should have been a kindergarten school teacher, the kids would have loved you. 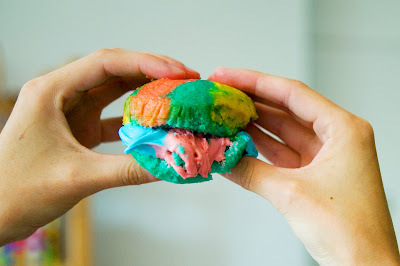 ok, so what food coloring do you use to get those vibrant colors without a yucky taste??? Your everyday life reminds me of a story book or something - you always do the cutest things and everything's always so pretty and colourful! Your food posts always look like they're straight out of the food fight scene in the movie "Hook". I love it! OMG you are a GENIUS!! ahhhh love the colors, it looks so delish and beautiful! FABULOUS! Quiero saber si eso es comestible! your posts like this always make me think of peter pan and the lost boys, in the movie Hook. They have a mad food fight with food in all the colors of the rainbow. Oh wow! 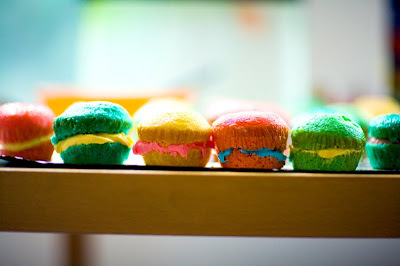 It gave me chills when I saw the picture of your "cupcake sandwiches". My grandmother (who passed away 2 yrs ago) used to make Italian creme cupcakes in this way. She would carefully cut the tops off the cupcakes and fill them with that creamy delicious filling. They were wonderful!!! Thank you for reminding me of her today! Hope you enjoyed your cupcakes! 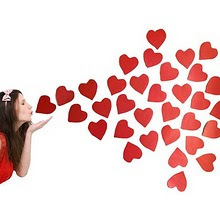 I love your blog, it is so colorful and you always have such sweet ideas! I definitely agree that you would be an amazing teacher! So much color and joy in everything you do. :} They look mighty tasty. I always eat my cupcakes this way! It's the best way to enjoy the cake to frosting ratio =). you have such a colorful life! and those cupcake-sandwiches look delicious! Yummy, yummy, yummy, yum, yum! Those are the most colorful and delicious sandwiches I've ever seen! you are such an inspiring person katie! wow your photography is cute! what is your weapon of choice and what settings do you use? fantastic compromise! these bright colors would brighten anyone's morning. ah! I've loved making these! 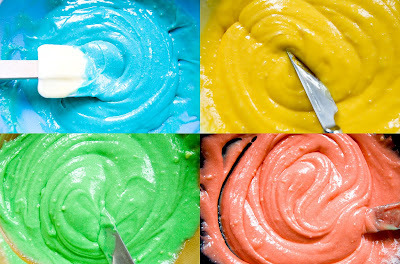 you should try using gel food colouring because the colours are so vibrant! this is a link to a cupcake that I made for a friend's birthday. What a poor decision to come onto your blog with an empty stomach! These look out of this world! God, I love how colourful your blog is! i truly hope you ate those for breakfast, and didn't go for something cliche like cereal or eggs. That is exactly what I thought! I always wanted a taste of the food from that scene. oh man this makes me think of the movie Hook, when the lost boys get in that crazy awesome food fight. yum yum and so pretty! It's like you speak to my inner being. I am instantly reminded of the movie "Hook". There is a scene where they all sit down to "imaginary dinner" and there are cakes and pies in these amazing colors. My mouth watered on that scene and is now watering for these delicious little whimsical delights! This is probably the best idea I have ever heard!!! So creative and tasty too! I think we are kindred spirits. Cupcake sandwiches love it!! Ever since I was a little kid, I have always cut cupcakes in half and turned the frosted end to the middle to make a cupcake sandwich. They're the best that way. These are adorable and look delicious! Jealous! Those are so colorful and fun-filled! What a clever and terribly fun idea! I might have to steal this idea from you very, very soon. It feels like a cupcake sort of afternoon. These look sooo delicious ! I wanna make some !